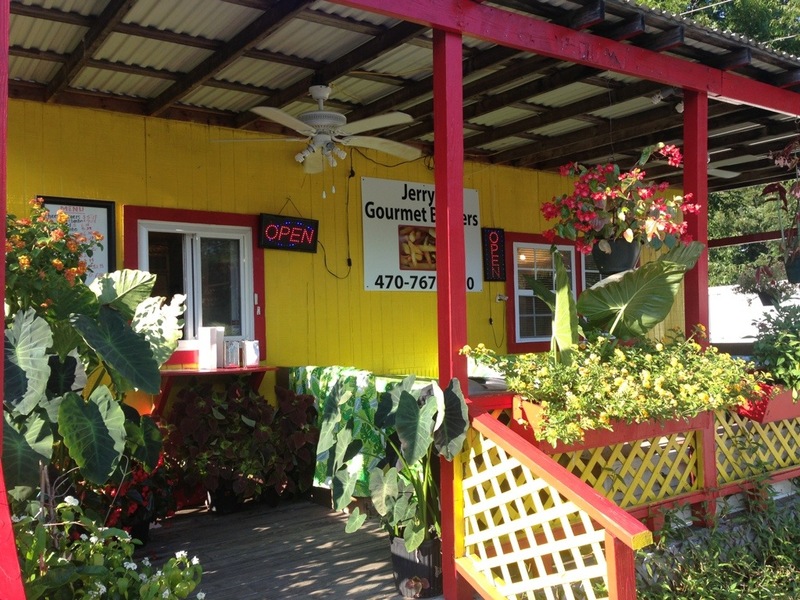 I don’t know where I heard about Jerry’s Gourmet Burgers, but, wherever it was, they didn’t lie. It is in a trailer, in the parking lot of a Texaco station, close to (and across the street from) Tanner Medical Center Villa Rica and they serve no drinks. Yep, not a drink on the menu. The supposition is that the space is leased from the owner of the Texaco and he wants to keep that revenue. At $3.28 for two 20 oz. Diet Cokes, I can support that theory. When we arrived a little after 6:00, the music was blasting from a speaker underneath the window. I stepped up to the window and saw no one inside – I could see a stovetop in a room off to the right, a refrigerator in the room on the other side of the window and a freezer in the back room. A few minutes later, a man appeared (he turned out to be Jerry) and waved us over and we stepped back up to the window. The menu is simple (cheeseburgers, philly cheesesteaks, roast beef sandwiches, beef hot dogs and chicken fingers) all available as a combo with fries. And pineapple cake and brownies. They’re open Mon-Sat 11:00 – 8:00 (except for the first Monday of the month, when they’re closed) and Sun 12:00 – 8:00. He told us it would be thirty to thirty five minutes, as he had eight or nine orders ahead of ours. We raised eyebrows at and then nodded to each other and said, “okay”. He then said, “it will be worth your while.” We wandered into the smoky- smelling Texaco, picked our drinks and went back to wait. Where would we sit? If we asked Dylan, he’d tell us to “just put some bleachers out in the sun and have it on Highway 61.” They had no bleachers, so we started at one of the three tables on the porch, but the sun drove us back into the car to wait. That’s okay – there was football on the radio. About fifteen minutes after we got in the car, Jerry stuck his head out the door on the side of the trailer and waved to us – signaling that our burgers were ready. 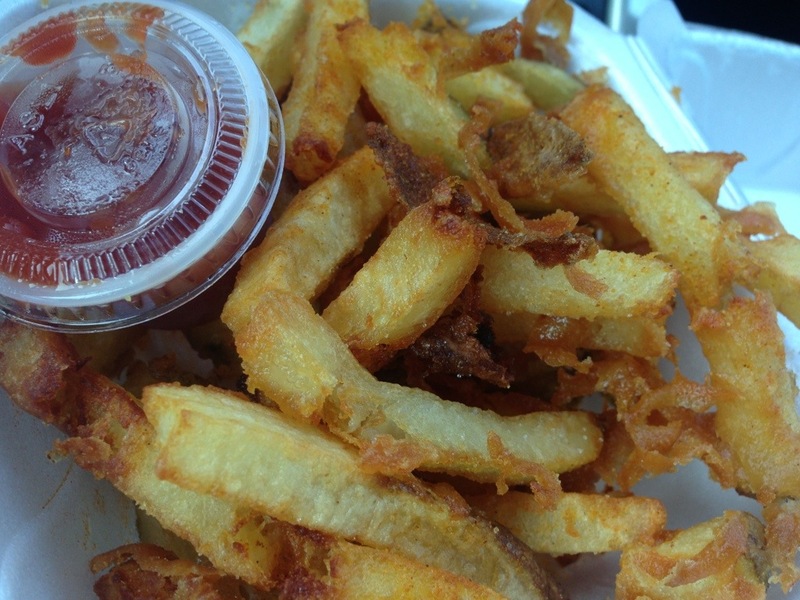 We picked up three styrofoam containers – two of them packed to the rim with burgers. It’s hard to do the burger justice, size-wise – you can see from the picture above that the burger is actually larger than the porch <g>. Seriously, it’s a little over a half pound of beef and it was a gooey mess. Jo ordered her burger with swiss, “all the way” (lettuce, tomato, onion, pickles, mustard, ketchup and mayonnaise). One of the challenges of cooking a burger this size – it was at least half of a pound – is getting it cooked to the same degree of “done” throughout. 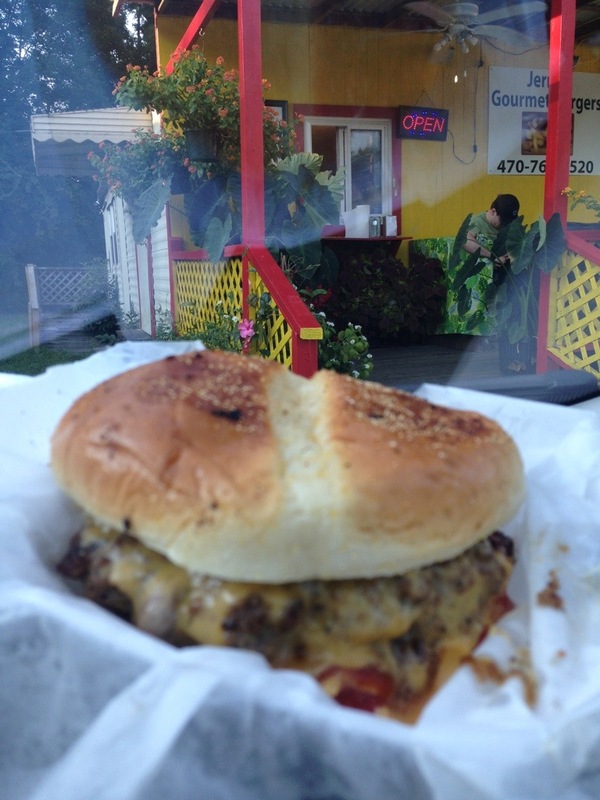 Jerry managed that – the burger was well done (brown throughout) without any charring or searing on the exterior. The fries were excellent and perfectly crunchy. As opposed to carry out packets, there were small plastic cups filled with ketchup and mustard. Having been open for about three and half months, Jerry has succeeded in creating a burger that is ridiculously messy (you can see how melted the cheese on mine was). I actually ended up picking mine up in the wax paper it was lying on and regularly draining the juice into the container so that it didn’t run all down my shirt. I don’t know that I’d drive back to Villa Rica just to get the burger, but it was a very large burger and very fairly priced (our two burgers and an order of fries were just over $13.00). Most of the folks that pulled up beside us were picking up call in orders. I imagine if you lived, or worked, in the area, that would be a good call to make. 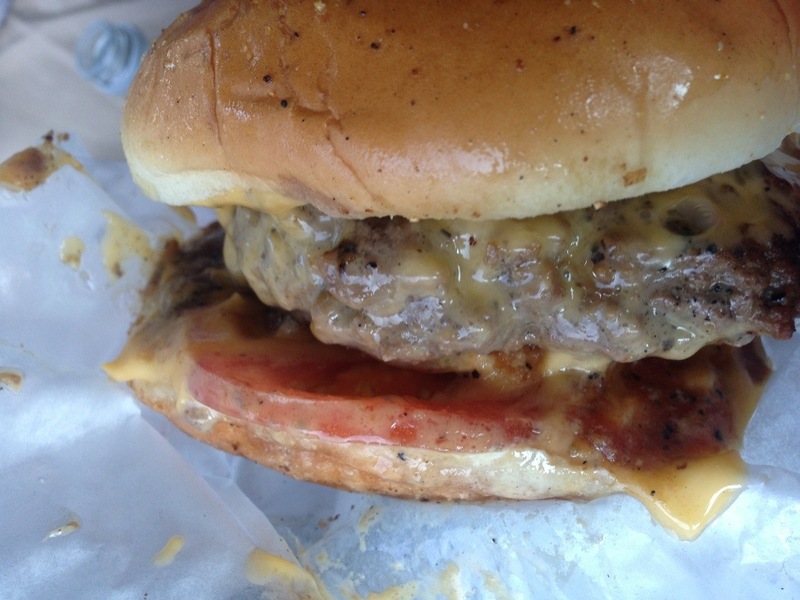 We tried Jerrys just last week and burger was delicious! Jerry did ask how we wanted burger cooked and it was done to perfection. I couldn’t get away without trying the pineapple cake that is cooked there also. Cake was light, with whipped topping and will be hard to resist the next time. Of course I seem to want the burger on the days he is closed as he is open Wed thru Sat only. We live down the road from Jerrys and I have eaten there perhaps 10 times in the last year with my wife. His burgers are almost always extraordinary — among the very best burgers we have ever had in our lives, and we consider ourselves something of burger connoisseurs. They truly are astonishingly good. Perfectly cooked, perfectly seasoned, extremely juicy, and Jerry himself is quite an eccentric character. The fries are also superb. He has also started offering delightful chicken curry dishes, which is a wonderful rarity out here in culinary forbidden zone that is Paulding. This place is well worth the trip and the wait. And believe me, you will wait. Even if you’re the only person there it’s still about 15 minutes and up to 45 when he’s busy. We don’t get out that way often enough and when I saw you commented on this post, I was afraid you were going to tell me that he had closed. Glad to hear he’s doing well. I’ll have to go back for the chicken curry. well, how did the burger taste? I didn’t realize that I didn’t say – thanks for asking. The burger was good, more done than I’d care for (I wasn’t given an option), didn’t taste to be heavily seasoned and didn’t taste particularly “beefy”. It was good, not great, much better than any of the fast food equivalents and you’re supporting a local business and what appears to be a nice guy, from our brief interaction.